The authors are with: 1 International Development Research Centre, South Asia Regional Office, 208 Jor Bagh, 110003 New Delhi, India; 2 Office of the Opposition Critic for Agriculture, Ottawa, Canada; 3 University of California, Davis, California, USA. 4 Empresa Brasileira de Pesquisa Agropecuária, Porto Velho, Brazil; and 5 Henry A. Wallace Institute for Alternative Agriculture, 4200 Edmonston Road, Suite 117, Greenbest, Maryland 20770-1551, USA. Acknowledgements. For comments on an earlier draft of this paper we are grateful to Henning Steinfeld, Cees de Haan, Carlos Sere and other participants in the Expert Consultancy on Policies for Animal Production and Natural Resources Management, held by FAO in Brasilia, May 1998. Dans cet article, des indices simples de la production et de la variabilité des prix sont présentés dans deux études de cas pour expliquer pourquoi les systèmes de gestion intensive ne sont pas répandus dans l'ouest de l'Amazonie, même s'ils semblent présenter des avantages agronomiques et financiers. Une étude de cas est consacrée au choix de la production dans un récent projet de colonisation, Pedro Peixoto dans l'État d'Acre, à l'ouest de l'Amazonie. L'autre étude concerne la municipalité d'Ouro Preto à Rondônia, une colonie agraire bien implantée où la production laitière est le système dominant, qui permet d'imaginer comment sera Pedro Peixoto dans 15 à 20 ans. Cette dernière étude de cas est axée sur l'avantage financier qu'il y a à adopter un ensemble de technologies améliorées pour l'élevage bovin, compte tenu des risques liés aux prix et à la production. Un risque élevé lié aux prix s'oppose à une intensification et à une spécialisation plus poussées dans la région de Pedro Peixoto; ce risque a le plus grand retentissement sur les utilisations intensives des terres qui donnent les produits agroforestiers et le moins grand sur les produits issus des pâturages - viande de boeuf et lait. Cela contribue à expliquer la dominance croissante des pâturages et des bovins dans cette zone. À Ouro Preto, la question est de savoir s'il faut continuer à avoir recours aux pâturages extensifs et relativement peu productifs ou intensifier ce système en améliorant le pâturage et la gestion. Des simulations effectuées compte tenu du risque lié à la production et aux prix ont donné le plus souvent des résultats négatifs, montrant à quel point celui-ci limite l'adoption des technologies. En este artículo se presentan medidas sencillas de la variabilidad de la producción y de los precios en dos estudios monográficos con el motivo de que los sistemas de ordenación intensiva no se adopten de manera generalizada en el Amazonas occidental, aún cuando parezcan derivarse de ellos beneficios agronómicos y financieros. Un estudio monográfico se refiere a la selección de la cesta de producción en nuevo proyecto de asentamiento en Pedro Peixoto, en el estado de Acre en el Amazonas occidental. El otro corresponde al municipio de Ouro Preto, en Rondônia, asentamiento ya antiguo en el que predomina la producción lechera, que constituye un punto de referencia sobre el aspecto que puede tener Pedro Peixoto dentro de 15-20 años. Este estudio monográfico se concentra en los beneficios financieros de la adopción de un conjunto de tecnologías mejoradas para el ganado vacuno con un riesgo en los precios y la producción. El riesgo elevado en los precios constituye un obstáculo para aumentar la intensificación y la especialización en la región de Pedro Peixoto, con una utilización máxima de la tierra de carácter intensivo, por ejemplo con productos agroforestales, y mínima en cuanto a los productos basados en el pasto derivados del ganado vacuno para carne y leche. Esto contribuye a explicar el creciente predominio del pasto y el ganado vacuno en la zona. En Ouro Preto, la alternativa está en continuar con un pasto extensivo y relativamente improductivo o intensificarlo pasando a sistemas mejorados de pasto y ordenación. Las simulaciones con riesgo en la producción y los precios dieron resultados en su mayor parte negativos, indicando la función decisiva que desempeña el riesgo en la limitación de la adopción de tecnología. Despite the popular belief that cattle production in the Brazilian Amazon is uneconomical, most landholders, small and large, continue to raise more cattle. Could it be that this common view about cattle in the Amazon is too pessimistic and that new production technologies, infrastructure improvements and shifting markets have overcome production problems, thereby aiding the development of a productive and sustainable industry (Faminow, 1997, 1998; Mattos and Uhl, 1994)? What has happened? First, the development of better pasture forages and management practices has contributed to higher productivity. Ranchers now know that shoddy management will lead to poor production rates and lower returns. Second, economic conditions in South America and especially Brazil are dynamic. Minimal inflation in the period 1995-98 reduced the need for holding land and cattle as inflation hedges. Recent devaluation of the Brazilian real will act as a stimulant for exports. Third, large-scale projects for agricultural expansion are out of favour and the colonization rush has been put on hold, maybe permanently. As a result, increased production on existing ranches and farms figures more in growing cattle numbers than it does in migration for the establishment of new operations. Intensification, often accompanied by specialization, can result in improved financial conditions and land management practices for cattle ranching and other forms of agricultural production in the Amazon. Specialization focuses on administrative and management talent, while intensification focuses on technology and inputs so that they maximize production. Case studies have pointed to the financial and ecological benefits of more intensive cattle production systems for ranches and farms in the Amazon (Faminow et al., 1998b; Mattos and Uhl, 1994; Murgueitio, 1990). However, despite some recent trends to specialization/intensification and academic studies suggesting the financial viability of more intensive management, extensive cattle production remains the norm among smallholders in the western Brazilian Amazon. Most of these smallholders have dual-purpose cattle production systems which continue to display the same low indices of herd performance and productivity today as they did more than ten years ago, even though the cattle herd has more than doubled. Put simply, most but by no means all smallholders in the western Amazon do not adopt the "on the shelf" improved production systems but continue to manage pastures and herds with traditional methods that often cause exceedingly low indices of herd performance. In this article, simple measures of production and price variability are presented as reasons why intensive management systems are not widely adopted, even though they seem to display agronomic and financial benefits. Two case studies demonstrate the importance of these two factors. One case study is an emergent settlement project, modelling pioneer farmer gross revenues from a basket of commodities including annual crops, livestock and agroforestry products. Pedro Peixoto, in the western Amazon state of Acre, is a relatively new colonization project with a large portion of cleared land still in annual crops but a rapidly growing cattle herd. A second case study is the municipality of Ouro Preto in Rondônia, a mature settlement which has been subject to agricultural development for more than 25 years. Ouro Preto provides a reference point for how Pedro Peixoto may look in 15 to 20 years, with most smallholder land in extensive and often unproductive pasture supporting rustic cattle herds with low milk and beef takeoff rates. This case study focuses on the financial benefits of adopting an improved cattle technology package under price and production risk. Intensification - when most farmland, assets and human capital are dedicated to cattle production through improved pasture and animal management techniques - appears financially feasible in the initial analysis but is a much less attractive investment when price and production risks are considered. Are there economic reasons for continued small landholder production in the region, exclusive of subsidies and/or land price increases? Does price risk help explain current land use decisions? How might risk affect future land use decisions, i.e. as the settlement project matures (Dahl, 1998)? The Pedro Peixoto government settlement district is in the state of Acre in the western Brazilian Amazon, with most land plots for the settlement located 50 to 100 km from the state capital, Rio Branco. Settlement in the Pedro Peixoto region is relatively recent. The Pedro Peixoto government settlement district was first opened in 1972 but the majority of settlers in the region, two-thirds of them, did not arrive until the 1980s (Fujisaka et al., 1996). Settlement in the Pedro Peixoto region was aided in the late 1980s when the section of highway BR-364 that runs from Porto Velho, capital of Rondônia, to Rio Branco, capital of Acre, was paved. Originally the settlement had 370 000 ha of land, divided among 3 200 families. In 1994 the average small landholder held approximately 80 ha of land with approximately 20 ha cleared and the remainder in forest (Witcover et al., 1996). Small landholders in the Pedro Peixoto clear primary forest and cultivate land for approximately two years. Rice is the annual crop planted most frequently in the first year. Other annual crops, such as corn, which is often relay intercropped with rice, are sown after the rice has been planted (Fujisaka et al., 1996). About two-thirds of the crop land area is then converted to pasture. Most commonly planted are three species of Brachiaria, Brachiaria brizanta, B. decumbens and B. humidicola. Most small landholders in the settlement district burn their pastures annually. The average stocking rate in 1994 was 2.2 head per hectare (Fujisaka et al., 1996). The remaining one-third of the land, the area not converted to pasture, is left to fallow after annual crop production. In order to provide insight into the first question - "Is smallholder production likely to continue?" - annual returns from simulated agricultural production were compared with reference income standards. The opportunity costs for most colonists are extremely low. The World Bank's poverty line and the Brazilian annual minimum wage are therefore utilized. Owing to a lack of reliable cost data, annual gross returns are used to proxy annual net returns. The use of gross returns provides a reasonable proxy for net returns because cash input purchases are usually minimal for smallholders. Small landholders in the Pedro Peixoto region use a minimum of purchased inputs, including hired labour, consistent with the fact that the region is poor in capital and labour and small landholders tend to adopt systems that do not exceed capital and labour constraints. In the simulation procedure, all prices have been defined by specific probability distributions (Dahl, 1998). Production estimates have not been defined by probability distributions owing to a lack of reliable data on production risk. Annual values of agricultural production, as estimated through the simulation process, are given in Table 1. 1 In 1995 the real was equal to US$1. Two standard deviations below and above the mean give a range for gross returns from the sample production basket of R$2 208 to R$3 824 annually. By way of comparison, the World Bank (1997) estimated the 1995 Brazilian poverty line to be 1 104 reais (in 1995 the real was par with the United States dollar) for the average household of 4.5 individuals. The estimated value of the sample production basket falls well above the World Bank's poverty line estimate. The estimated value of annual production is also above the minimum wage, which varied somewhat but averaged approximately R$1 200 in 1995. Note that the estimated annual return is higher than the annual income that would be earned from off-farm labour, even if it is assumed that both parents worked to earn two minimum wages. It shows that the cash value of smallholders' production baskets is substantially higher than the income earned by the poorest residents of Brazil, so smallholders do not enjoy obvious financial incentives to abandon farming for waged labour. It should be remembered that the financial simulations are for emergent farmers, who have successfully established farming operations, after the unsuccessful ones have already departed. In the production basket developed by Dahl (1998), commodities with the lowest degree of price risk account for the largest portion of annual gross returns, while commodities with the highest degree of price risk make up the smallest proportion of annual gross returns. One measure of risk is price volatility (Cabuszewski and Field, 1985). Like the coefficient of variation, price volatility is a unitless measurement of price variation. Unlike the coefficient of variation, however, volatility is not affected by the time interval in which prices are measured, e.g. weekly versus monthly, so comparisons between price series such as United States futures prices and commodity prices in Acre can be made. Table 2 compares price volatility for two different reference cases, the Chicago Board of Trade and a reference state in the south of Brazil (Paraná), with the production basket for the Pedro Peixoto settlement district. Volatility in Paraná and the Chicago Board of Trade is similar. However, price volatility in the Pedro Peixoto settlement district is significantly higher than that found in the southern agricultural region of Brazil or in agricultural markets outside Brazil. Pasture products - milk and beef - have the lowest degree of price variation. Annual crops - rice, maize and beans - have the next lowest degree of variation, while the extracted forest product, Brazil nut, varies the most. 1 Volatility of the March 1998 futures contract, 30 January 1998, from the Chicago Board of Trade (CBT) Web page, shows that prices in the developed south of Brazil (Paraná) display volatility levels similar to those of CBT, while in Pedro Peixoto, prices are much more volatile (www.cbot.com). The high degree of price risk may help explain current smallholder production decisions. In the simulation analysis carried out above, for example, pasture products comprised 52 percent of annual gross returns, while Brazil nuts, which have a very high degree of price risk, made up only 5 percent. Rice, maize and beans have an intermediate level of price risk and also comprise an intermediate share - 43 percent - of gross returns (Table 3). 1 For a full explanation, see Dahl (1998). the coefficient of variation for beef cattle is roughly ten times smaller than the coefficient of variation for Brazil nut, coffee and bananas. 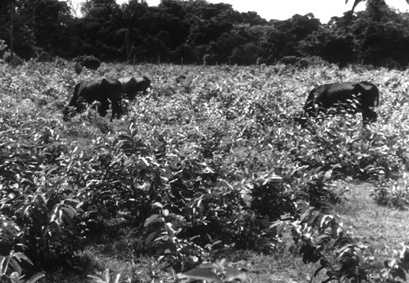 divert to high intensification of agroforestry products, such as bananas, coffee and Brazil nut. Other things being equal, risk-averse smallholders are likely to focus much of their resource use on commodities with lower risks, such as pasture-based products - cattle and milk. This matches the observed practices in Pedro Peixoto, where rapid increases in pasture and cattle herds are occurring. However, one goal of intervention strategies could be to encourage cattle management intensification in order to maximize the benefits from use of land already deforested and likely to remain in, or be diverted to, pasture. The region around Ouro Preto D'Oeste in central Rondônia, hereafter simply referred to as Ouro Preto, provides one likely outcome of a new settlement project like Pedro Peixoto continuing on the path towards increased cattle herds (Faminow et al., 1998a; 1998b). Ouro Preto was originally a planned settlement established in the early 1970s, associated with the construction of Federal Highway BR-364 from Cuiabá, Mato Grosso, through Rondônia to Acre. Subsequent paving of the road to Porto Velho, expansion of feeder roads and large-scale settlement in Rondônia occurred in the 1980s. The region around Ouro Preto has developed into a major milkshed in Rondônia. Milk productivity per cow in Ouro Preto and Rondônia is roughly 80 percent of the Brazil average, which itself is low by world standards. The recent establishment of a milk processing plant in Ouro Preto by Parmalat, the huge Italian agribusiness company, signifies growing importance as a regional milk production centre and will most likely stimulate further herd increases. The Ouro Preto settlement can be considered a mature colonization site. According to the 1995 census, about two-thirds of the region's total land area is in pasture, with small amounts in crops and fallow. Only 25 percent remains in forest cover, in a region that was originally all forested. In comparison, for the entire state of Rondônia, 2.9 million ha of a total 8.7 million ha are in pasture, 0.4 million ha in crops, 0.3 million ha in fallow and 5 million ha remain in natural forest. A pattern farm was designed for a case typical of the Ouro Preto region - small emerging cattle operations - in order to illustrate the effects of an investment to improve the cattle management system for the farm (Faminow et al., 1998a; 1998b). Farm size is 100 ha, typical for farms in the Ouro Preto region. The studied investment focused around the establishment and proper management of "improved" pasture that utilizes a mix of Brachiaria brizanta and Pueraria phaseoloides (tropical kudzu), a legume. In Ouro Preto and throughout the Western Amazon, most smallholders have dual-purpose cattle herds, primarily oriented to milk production but with the objective of producing male calves that will be well suited to beef production. Farm families generate income from the sale of cattle and milk but may also consume a share of production on the farm, utilize animals for draught purposes and/or integrate cattle into crop production by using manure to fertilize soil. Under ideal conditions, pastures with the improved pasture technology would be capable of supporting average annual stocking rates of 1.5 animals per hectare over a 20-year period. In this region, there are four main entry points to improve cattle herd condition and productivity (Faminow, 1998). 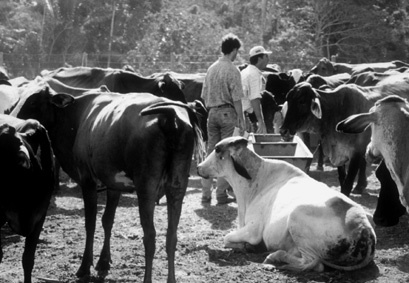 Following recommendations of the Empresa Brasileira de Pesquisa Agropecuária (EMBRAPA) specialists, a budget for a multifaceted herd improvement package on these four entry points (improved nutrition, better health management, genetic improvement and controlled reproduction) was prepared and then analysed using an investment model of the type described by Gittinger (1982). Low-cost measures, such as vaccinations, have increasingly been adopted by smallholders in Ouro Preto but more costly components of the package, such as improved pasture and additional fencing for better rotations, are usually not adopted. Assessment of the base case showed positive net present value for the investment, with an internal rate of return of 12.6 percent over the 20-year planning horizon (Faminow et al., 1998b). The pattern of net financial benefits was typical for many agricultural investments, with negative flows over the first four years and then generally positive and increasing returns over the remainder of the investment period. Sensitivity analysis carried out for the key parameters of daily milk yield, lactation period, milk price, cattle prices, herd growth rate and pasture yield indicated that results were particularly sensitive to production variations. Overall, the base analysis suggested an optimistic prognosis for adoption of an improved technological package by smallholder cattle producers. However, efforts to instil improved livestock production systems among smallholders in the Amazon go back to the early 1970s, when pastures were promoted as a sustainable use for deforested land. Despite 25 years of research and promotion, improved pasture technologies and livestock management systems have not been widely adopted by most smallholders. Instead, many smallholders continue to display low indices of herd productivity and condition. Because risk is often an important determinant of smallholder behaviour, this might underlie the apparent disparity between simulation results and actual farmer decisions. Parameters in the base model were made stochastic by setting a triangular distribution around each parameter. Different forms of the triangular distribution are utilized to study the effects of experimental station bias and effective technology transfer. If agricultural experimental station data for technical coefficients are from the best lands, under conditions with deep research pockets and incomplete cost accounting, as is widely argued, then using scientific data to establish model parameters will bias financial simulation results. Test station yields are more likely to establish the frontier of possible productivity than to indicate typical yields in commercial applications. This possibility was treated in simulations by using an asymmetrical distribution. The statistical mode of milk yields from the improved system, as approximated by EMBRAPA researchers, is set at 5 litres per cow per day. To reflect bias, however, the lower endpoint of the distribution remains at 0.5 litres per cow per day, while the mode is near the upper endpoint of 5.5 litres per cow per day. This range is consistent with field observations for the region (EMBRAPA, 1995). While the experimental station results have the highest probability, producers may still experience the low productivity values found before implementing the technology package. This implies that the research station productivity values are really drawn from the extreme upper end of the production possibilities and actual field production will be lower. In contrast, the symmetrical distribution is centred on the expected value of agricultural researchers. This reflects the case where researchers anticipate the mean values fairly, with the distribution symmetrically dispersed around the mean. This also implicitly presumes effective technology transfer, perhaps through an extension programme. prices and milk production are both allowed to vary. For example, take the case of a 3 percent discount rate with only production allowed to vary. The simulation procedure calculates net present value with prices drawn from the probability distributions. This is then repeated for 1 500 simulations, with the mean and standard deviation of incomes being 7 758 and 10 938 reais respectively. Note: negative returns indicated by parentheses. 1 SD = standard deviation. Several important points from the simulations can be highlighted. The financial returns from adoption of improved cattle production technology are low and very risky. Only at very low discount rates are positive mean net present values found, which must be tempered by the very large standard deviation. At discount rates higher than 3 percent, mean net present value is always negative. Risk is diminished for the high discount rates, which implies that a large negative return from adoption of the technology package is highly certain. Virtually 100 percent of the simulations with a 12 percent discount rate have a net present value that is negative. More than 80 percent of the outcomes with a 9 percent discount rate and half of the simulations with a 6 percent discount rate are negative. If agricultural researchers typically identify the top end of production possibilities, a financial feasibility analysis using experimental station data, even when subjected to sensitivity analysis, will tend to overestimate the potential payoff from technology adoption. Thus, for Ouro Preto and other mature settlements where most land is already committed to pasture, the technology options can be quite limited. Investment in the improved system suggested by EMBRAPA specialists involves substantial initial expenditures, while smallholder credit is limited. The financial benefits of this investment depend critically on smallholders attaining the high milk yields demonstrated on experimental stations under conditions where the smallholders face risks while researchers do not. If farmers believe that researchers are overoptimistic in their production projections and farmers suffer from cash flow constraints, adoption of improved management packages will occur either partially or not at all. Even when some of the components of the technological package are adopted on a trial basis, improvements may be shortlived - production may initially rise, but gains are not sustained - because of genetic dilution and other production problems. Les pâturages peuvent être durables. Celui-ci, qui appartient à une petite exploitation non loin d'Ouro Preto, est en production continue depuis 17 ans. High price risk is a barrier to increased intensification and specialization in the Pedro Peixoto region, with price risk greatest in the intensive land uses, such as agroforestry products, and lowest in the pasture-based commodities of beef cattle and milk. 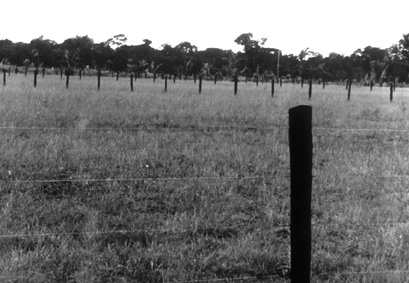 Relative levels of price risk can partially explain small landholders' production choices. For example, pasture products offer the lowest degree of price risk which may, along with other factors such as low labour and capital requirements, help explain the large portion of annual income generated from pasture products. Relative levels of price risk may also help predict the future path of agricultural production in the region. With improved access to markets, smallholders tend to specialize to a greater degree, often in the less risky commodities. The second case study was for Ouro Preto, a mature settlement where much of the forest cover is already gone and most land is already in use as pasture. The options here are even more limited. Increased production of tree-based agroforestry crops such as coffee and bananas is a possibility, but one that is unlikely to have a meaningful impact on land use. The main land use choice in Ouro Preto is whether to continue with extensive and relatively unproductive pasture or to intensify into improved pasture and management systems. Baseline results for Ouro Preto suggest that improved cattle management systems are profitable and should be adopted. However, field observation indicates that "on the shelf" technology often remains unused, especially those components of the technology package that are most critical but also most costly to adopt. When both price and production risk were analysed, one explanation for this apparent anomaly became apparent: stochastic simulations gave mostly negative returns, indicating the key role that risk plays in the benefits to adopting the technology. The financial benefits of adopting improved cattle technologies are also limited by the capability of smallholders to attain yields similar to the ones derived from experimental stations. Thus, it appears that effective extension efforts are fundamental for small landholders to acquire and use effectively new technology such as improved pasture and animal management techniques. Otherwise, under the risky conditions in which they operate, technologies that seem appropriate may remain on experimental stations, unused by smallholders. This is not a new story, but one that has long been known to agriculturalists. However, it is a story that appears to go largely unheeded in the western Amazon. Cabuszewski, J.S. & Field, J.C. 1985. Inside commodity markets. New York, John Wiley. Faminow, M.D. 1997. Spatial economics of local demand for cattle products in Amazon development. Agriculture, Ecosystems and Environment, 62(1): 1-11. Faminow, M.D. 1998. Cattle, deforestation and development in the Amazon. Oxford, UK, CABI. Faminow, M.D., de Sá, C.P., Oliveira, S.J. de M., Valentim, J.F. & Vosti, S.A. 1998a. Development of an investment model for the smallholder cattle sector in the western Amazon, I Preliminaries. Porto Velho, Brazil, EMBRAPA. Boletim de Pesquisa, No. 16, Dec. 1997. Faminow, M. D., Oliveira, S.J. de M, de Sá, C.P. Valentim, J.F. & Vosti, S.A. 1998b. Development of an investment model for the smallholder cattle sector in the western Amazon, II baseline results. Porto Velho, Brazil, EMBRAPA. Boletim de Pesquisa, No. 17, Dec. 1997. Fujisaka, S., Bell, W., Thomas, N., Hurado, L. & Crawford, E. 1996. Slash and burn agriculture, conversion to pasture, and deforestation in two Brazilian Amazon colonies. Agriculture, Ecosystems and the Environment, 59(2): 115-130. Gittinger, J.P. 1982. Economic analysis of agricultural projects. Washington, DC, Johns Hopkins University Press. Mattos, M.M. & Uhl, C. 1994. 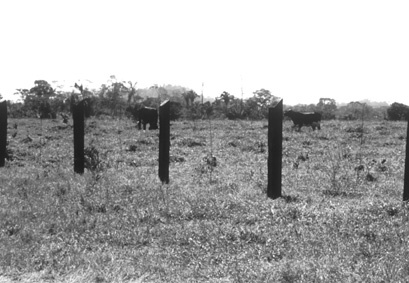 Economic and ecological perspectives on ranching in eastern Amazon. World Development, 22(2): 145-158. Murgueitio, E. 1990. Intensive sustainable livestock production: an alternative to tropical deforestation. Ambio, 19(8): 397-400. Witcover, J., Vosti, S.A., de Almeida Barbosa, F.R., Batista, J., Beatriz, V., Boklin, G., de França, S.B., Castilla, C., Fujisaka, S., Gallo, S.L.F., Garcia, J.H., Cabral, W.G., Hurtada, L., Leite, A., Leite, F.M.N., Souza, D.A., Marinho, J.T. de S., Rocha, K. & Neto, C.R. 1996. Alternatives to slash and burn agriculture: a characterization of the Brazilian benchmark sites of Pedro Peixoto and Theobroma, August/September 1994. Washington, DC, International Food Policy Research Institute MP-8, Working Paper No. US 96-003. World Bank. 1997. World development report, 1997: the state in a changing world. Washington, DC, Oxford University Press for the World.